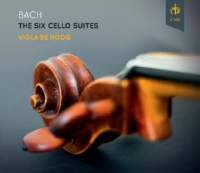 violoncello da spalla, it is reassuring that this latest addition to the long list of cello recordings seems so fresh and inventive. Viola de Hoog’s background as both a baroque and modern cellist (she performed for 20 years with the Schönberg Quartet and has been principal cellist with Concerto Köln and the King’s Consort) is immediately apparent. Her interpretation deftly synthesises historically informed technique with surprisingly romantic phrasing. De Hoog paints with long and elegant lines while enjoying the darker colours of her Guadagnini. Her gigues contrast a full legato with well‑articulated and animated staccato while her preludes and sarabands draw out a resonance viol players would be proud of. Confident and affective ornamentation finds its way into a number of movements, from selective use of vibrato as a special colour to more brazen cadenza‑like digressions. The end of the D minor prelude is adorned with the sort of performer‑invented divisions many cellists shun as 'interfering with Bach' but which de Hoog performs with convincing agility. Perhaps we can ignore the research a little longer.